Blake was born on November 8, 1897 in Westerly and graduated in 1916 from Westerly High School, he was the star center on the football team and a member of the track team. After a semester of college in Boston, he volunteered for the American Ambulance Service in January 1917 before the US entered the war. He sailed for France shortly thereafter, and participated in the Battle of Verdun. He applied for French Army Aviation and was accepted June 1917, becoming a member of the Lafayette Flying Corps. 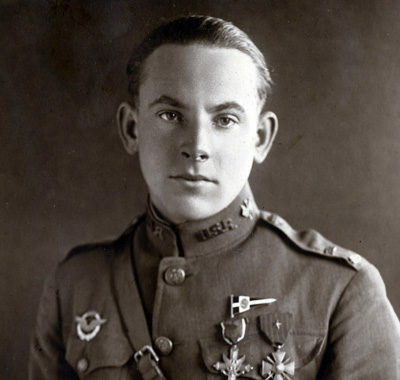 He was commissioned a First Lieutenant in the US Aviation Service on March 17, 1918, and was sent back to his former French unit on detached duty. He flew more than 100 hours over enemy territory and completed 37 bombing missions. He and his observer/gunner earned the Distinguished Service Cross and the French Croix de Guerre on August 9, 1918, when they fought off a number of German airplanes and completed their mission. He joined the Rhode Island State Police in 1930 and had reached the rank of Lieutenant when he was recalled to active duty in February of 1941. He served as director of counterintelligence (renamed security services) for the Office of the Chief of Army Corps for the remainder of the war, He retired in 1945 and died in 1958. He is buried at Arlington National Cemetery.